Kick off your 4th of July on Thursday night, July 2nd, with running, music, food and fun—including our new “About-One-Mile” Fun Run for the 12-and-under crowd! 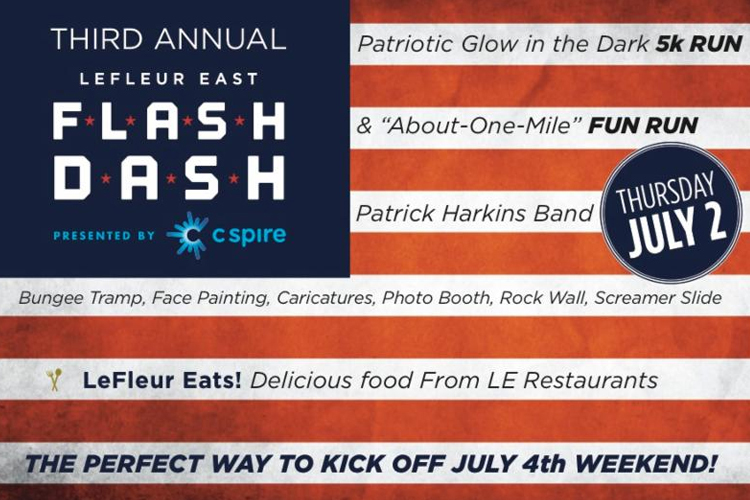 All paid participants will receive a Flash Dash t-shirt, flashers for the race, great food from some of LE’s “LeFleur Eats” restaurants, two tickets for drinks from McDade’s, plus entry into raffles for great door prizes from LeFleur East merchants. Race packets and walk-up registration will be available here at Buffalo Peak until 6:00pm on Thursday, July 2. Following the 5k, the Patrick Harkins Band takes the stage for an evening of great party music. We will present awards for the first place male and female 5k finishers and our Most Patriotic male and female runners, and draw for door prizes. There will be a climbing wall and bungee trampoline for the older kids and an inflatable slide for the little ones. Kona Ice will also be on hand with snow cones to cool off even the hottest runners.